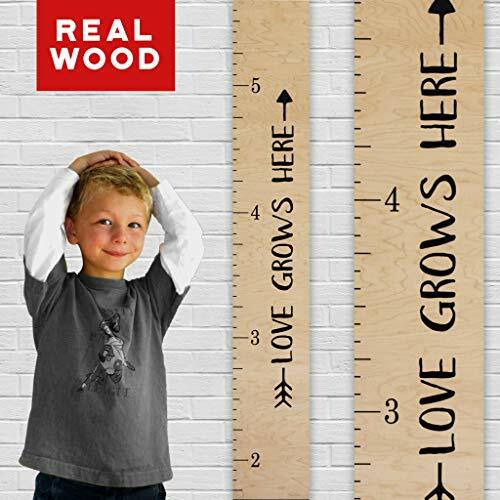 This beautiful wooden growth chart ruler is just like the ruler you used in school - only bigger! Hang on your wall, grab your marker, and line the kids up! Premium QualityWe start with high-quality Baltic Brich plywood cut to size for each chart. The design is printed directly onto the wood using UV curable non-voc inks for a beautiful finished piece. Its topped off with two coats of clear sealer preserving the finish and making it easy to record your marks. This piece is sized to approximately 59.75"h x 7.25"w (scale measures from 1'9" to about 6'8"). A hanger is included on the rear of the chart along with a note indicating the correct mounting height so its ready for immediate hanging. We recommend a Sharpie permanent marker (not Sharpie Pen) for making notes and charting your child's height. 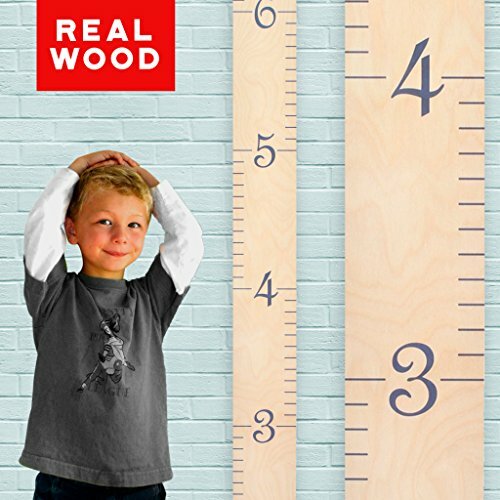 Our height charts are printed on the highest grade CARB compliant Baltic Birch plywood. Birch is a highly renewable resource and the natural wood background lends a unique look to each chart. No two charts are exactly the same, as some have more noticeable wood grain than others while others may have naturally occurring bird's eye knots. We find these naturally occurring marks give each of our handcrafted charts a unique character all its own. 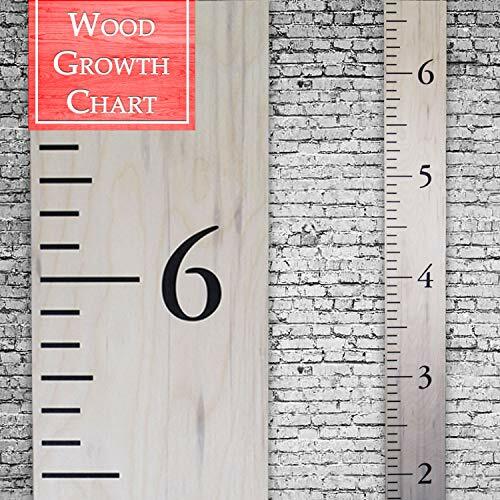 The inks used in the printing of each growth chart are no-voc inks, called UV curable inks. They are solvent free and will not fade over time. Printed directly onto the wood, bonding with and staining the wood fibers. We do not use toxic polyurethanes as they can gas off in your home for up to five years. Use any pen, pencil or sharpie, and begin marking moments in time! We hand sand our products, making the edges super soft. OUR CHARTS ARE GUARANTEED FOR A LIFETIME! BUY WITH CONFIDENCE! Meticulously made in the USA. Because years filled with growing children are years to remember! Happy Measuring! As always, let us know if you have any questions. We'd be happy to hear from you! Adventure Awaits! 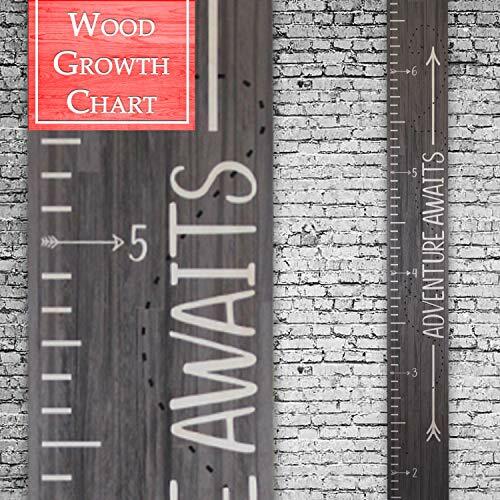 This wooden growth chart calls to all explorers, imagineers, and future trailblazers! Hang on your wall, grab your marker, and line the kids up! Premium QualityWe start with high-quality Baltic Brich plywood cut to size for each chart. The design is printed directly onto the wood using UV curable non-voc inks for a beautiful finished piece. Its topped off with two coats of clear sealer preserving the finish and making it easy to record your marks. This piece is sized to approximately 59.75"h x 7.25"w (scale measures from 1'9" to about 6'8"). A hanger is included on the rear of the chart along with a note indicating the correct mounting height so its ready for immediate hanging. We recommend a Sharpie permanent marker (not Sharpie Pen) for making notes and charting your child's height. Do it yourself vinyl decals - wood not included. 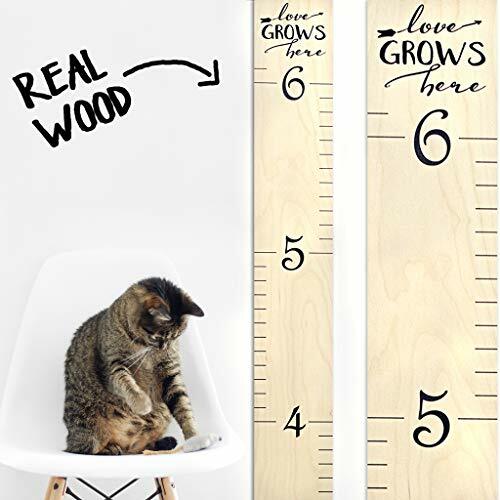 Using this DIY vinyl decal kit you can easily make your own professional looking growth chart ruler - a great way to track and display the growth of little ones in your home or nursery. 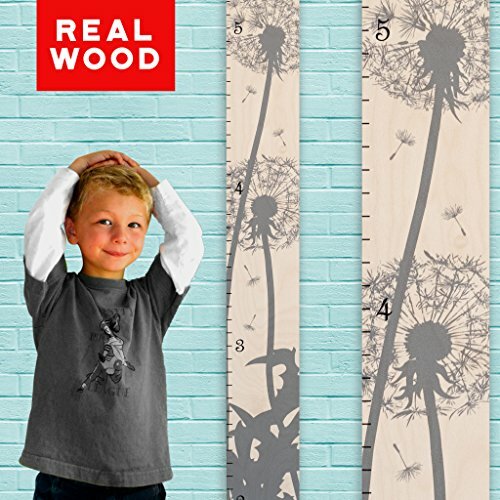 Join thousands of diyers who have used this vinyl decal kit to successfully and easily make their own growth chart ruler by saving the time and headache of hand painting the lines and numbers on the board themselves. Kit includes: 1) 72" of vinyl measuring lines that come as six separate decal strips (12" tall/ea. And approx. 2" wide). 2) Each of the S 1-6 as separate decals to place and orientate vertically or horizontally according to your preference (each approx. 2.5" tall x 1.5" wide). 3) Easy to follow, detailed and complete directions including: A) Instructions for selecting the correct size wood. B) Tips and advice for finishing the wood. C) layout and application instructions for the vinyl decals to design your ruler to hang 8" off the floor (to allow for varying baseboard heights) and measure up to 6'8". 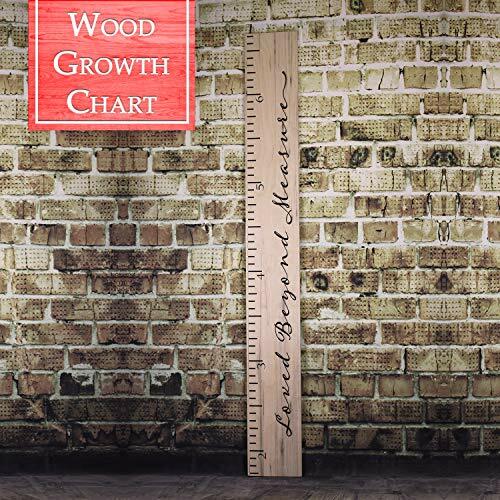 Classic wooden growth chart with a classical style lettering. Hang on your wall, grab your marker, and line the kids up! Premium QualityWe start with high-quality Baltic Brich plywood cut to size for each chart. The design is printed directly onto the wood using UV curable non-voc inks for a beautiful finished piece. Its topped off with two coats of clear sealer preserving the finish and making it easy to record your marks. This piece is sized to approximately 59.75"h x 7.25"w (scale measures from 1'9" to about 6'8"). A hanger is included on the rear of the chart along with a note indicating the correct mounting height so its ready for immediate hanging. We recommend a Sharpie permanent marker (not Sharpie Pen) for making notes and charting your child's height. 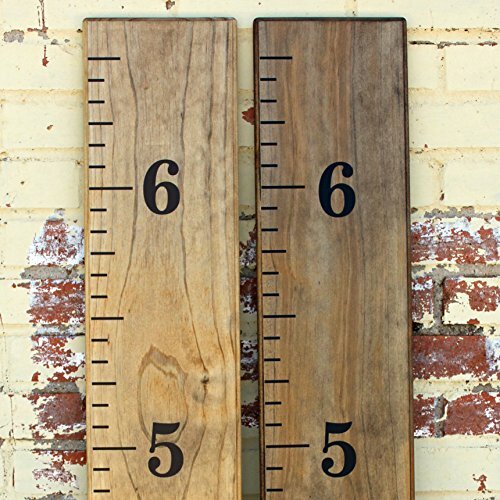 Want more Wooden Height Chart similar ideas? Try to explore these searches: 5 Box Calendar, Midtown New York, and Oak Storage File Cabinet.